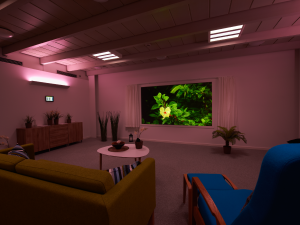 Dementia Centrum Aarhus actively work with stimulation in a new combination of light, sound and images to calm outward-responsive dementia citizens. 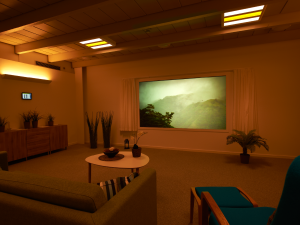 Results of an analysis made by the personal of the use of the new therapy room shows that the tailored stimulation help the residents to calm down, reduces walking around and enhances presence and joy. 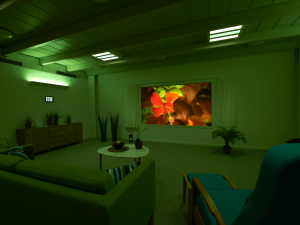 100 % – all 10 citizens with depressed mood experienced a positive effect from being in the therapy room. 93 % – 13 out of 14 citizens that were very passive experienced that they were more awake and active from the stimulation. The feeling of sadness disappeared in short or longer periods. 86% – 12 out of 14 citizens with anger and externalizing behavior have experienced an effect. 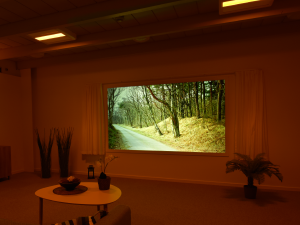 83 % – 25 out of 30 citizens with physical and mental restlessness the therapy room have had a positive effect. 63% – 5 out of 8 citizens with problems sleeping and a disruption of their circadian rhythm experienced a positive effect – they could calm down and fall asleep. Moving in: Often moving into the nursing home is a stressful event for a new occupants, relatives and staff. New impressions, facilities, people and sounds. 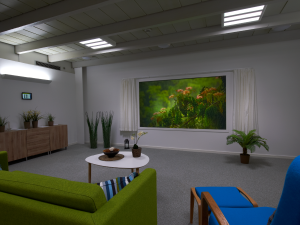 Here the stimulating living room have great success to calm and support the process. Relatives: The room has been a positive experience to many relatives. The room promotes the ability presence and recognition. Nutrition: Citizens can better find peace and cooperation to eat or drink. A combination of soothing light and focused attention.